This ad pissed me off so much that I trudged two blocks out of my way in the snow (uphill both ways!) to take a photo so I could rant about it. "When was the last time you cried at a Cubism Exhibit?" Really, Lyric Opera? You want to play that game? Cubism: 1907–1919. Opera: 1597–1921*. You think ragging on a early 20th century art movement is the way to score points and get people to come see your ancient and dying niche art form? The couple of hundred people in Chicago who might be interested in going to a Cubism Exhibit, those people are not your enemy, they're the same people who might possibly come to a Lyric show. They might go to a Cubism Exhibit in the afternoon and then a Lyric show in the evening. But now you're criticizing them for having enjoyed that afternoon exhibit (when was the last time there actually was a Cubism exhibit in Chicago, anyway?) and making them feel defensive. Dammit, this ad makes me want to go out and paint some Cubist paintings. I mean, it has to be more fun than falling asleep in the middle of the First Act (g'damn Billy Budd). "Only Lyric combines music, song and theater into one incredibly moving performance." Really? Only Lyric? Because you're the only opera in town, Lyric? Oh wait, you're not? Huh. Other ads in the series highlight the positives of the Lyric with comparisons to pop culture -- "More deceit and intrigue than a Hollywood marriage" -- but I really think they misstepped with this one. * Death of Caruso. You heard me. Thank you, Fuzzy! I was just as outraged when I saw the image. The only 'nice' thing I can say is at least it proves that stupid thoughtless advertising still lives. FAIL! You make a good point. 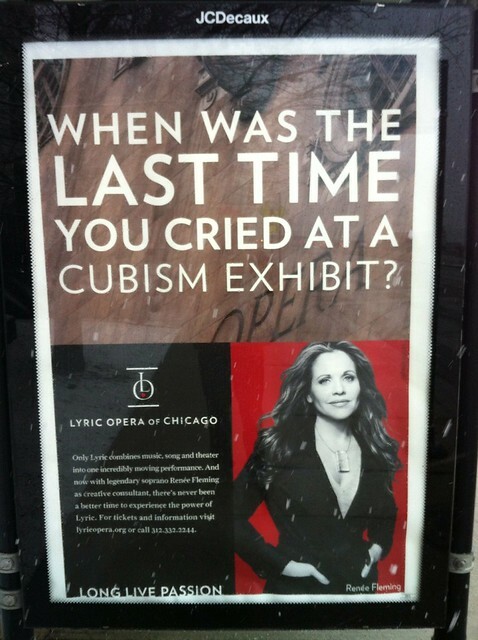 When I first saw this advertisement, I thought they were announcing some innovative new cubism exhibit that featured live opera singers peppered throughout and that the combination was, in fact, so moving that it would actually make you cry.